Bremerton has another winner in the Wyland Foundation’s National Mayor’s Challenge. Teacher Bobbi Busch and her seventh and eighth grades classes at Mountain View Middle School were declared the Northwest regional winner in the Classroom Edition of the challenge. The 100 or so students in Busch’s three seventh-grade and two eighth-grade classes joined the competition simply by going online, taking the water pledge and listing their teacher. Busch said she heard about the contest from Bremerton’s Kathleen Cahall during a meeting of science and math teachers. One winner was chosen at random from each region of the country. Thanks to the effort, Busch will receive a $250 gift card for purchasing supplies for her classroom, and the school principal will receive an identical $250 card to buy something for the school. Bremerton came in third this year in the National Mayor’s Challenge for Water Conservation, a contest that encourages people to take a pledge to save water. Third place is a very good showing, but not as good as the past two years, when Bremerton took the first-place spot in the nation. In 2012 — the first year of the contest — Bremerton came in third as well. 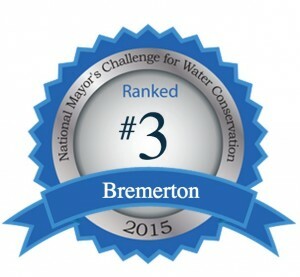 That makes Bremerton the only city to place among the top three for its size in all four years of the contest, noted Kathleen Cahall, Bremerton’s water resources manager. The two cities that exceeded Bremerton’s efforts this year were Ponway, Calif., in first place, and Hot Springs, Ark., in second. Each had more people, by percentage, who took the pledge than those lower on the list. Olympia, which is in the same population category as Bremerton (30,000 to 100,000), came in ninth, not a bad showing at all. Seattle came in eighth among cities with populations of 600,000 and more. No other cities in Washington state made the list of the top cities. If Bremerton area residents carry through on their pledges, they will save enough water to fill 24 Olympic-size swimming pools each year, according to a news release from the Wyland Foundation (PDF 360 kb), which sponsors the competition. That’s 15.6 million gallons. Beyond the water savings, Bremerton area residents agreed to reduce their use of disposable water bottles by 46,424 bottles, according to the report. Other proposed actions could save 495,000 pounds of trash going to the landfills, 138,000 gallons of oil and 75 million pounds of carbon dioxide. In all, residents from more than 3,900 cities signed more than 391,000 online pledges to save water. As in last year’s contest, residents from the winning cities will be entered into a drawing for more than $50,000 in prizes. Kathleen Cahall and city employees Lisa Campbell, Teresa Sjostrom and Kelsie Donleycott did a good job getting the word out about this year’s challenge, and many local businesses provided information to their customers. As always, Mayor Patty Lent’s personal involvement and interest in water resources helped generate support for Bremerton’s high standing in the contest. On a somewhat related topic, state and local water-quality officials have been spreading the word this month about using commercial car washes to recycle washwater from vehicles. The goal is to save water and prevent pollution from going into storm drains that flush into streams and bays. The 3 million cars in the Central Puget Sound region can contribute nearly 10,000 gallons of gasoline, diesel and motor oil to waterways each year, along with 19,000 pounds of phosphorus and nitrogen, 2,900 pounds of ammonia and 1.4 million pounds of solid waste, according to a news release from the Puget Sound Car Wash Association. School and other nonprofit groups can sell tickets to car washes — an alternative to holding car washes in parking lots that lack adequate controls for pollution. In Kitsap County, check out the Fundraiser Car Wash Program. One can also contact local car wash operators directly, or view a list of operators in the Puget Sound region that have joined the PSCWA program. UPDATE 2, Monday, Sept. 29, 10:51 a.m. The Department of Ecology has issued has press release which begins “Contrary to a story in today’s USA Today, Washington has not banned residential car washing.” I’ll provide a link once it’s posted on Ecology’s Web site. UPDATE, Monday, Sept. 29, 9:30 a.m.
USA Today offered a story on this issue 14 hours ago, and already 120 comments — including one from Sandy Howard of Ecology — have been recorded. If you wash your car and notice that soapy runoff is washing down a storm drain that flows into a stream or other waterway, you are technically in violation of the law. The Washington Department of Ecology wants cities to adopt a standard, as part of their local stormwater rules, that recognizes the problem of soaps and detergents carrying toxics into the state’s waterways. Now, before anyone gets up in arms about Big Brother watching to see who might be washing his car, Ecology officials have stated that nobody should worry about getting a ticket or facing legal action for allowing soapy water to run down a driveway. In fact, since this issue blew up in Clark County, Ecology Director Jay Manning has come out with a detailed, two-page letter (PDF 52 kb) covering the law of car washes and calling for a little common sense.